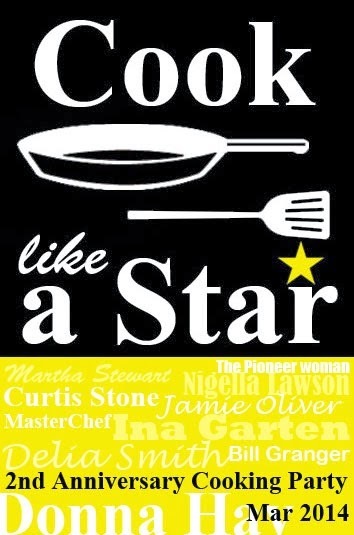 This is Donna Hay’s Easy Chocolate Cake. 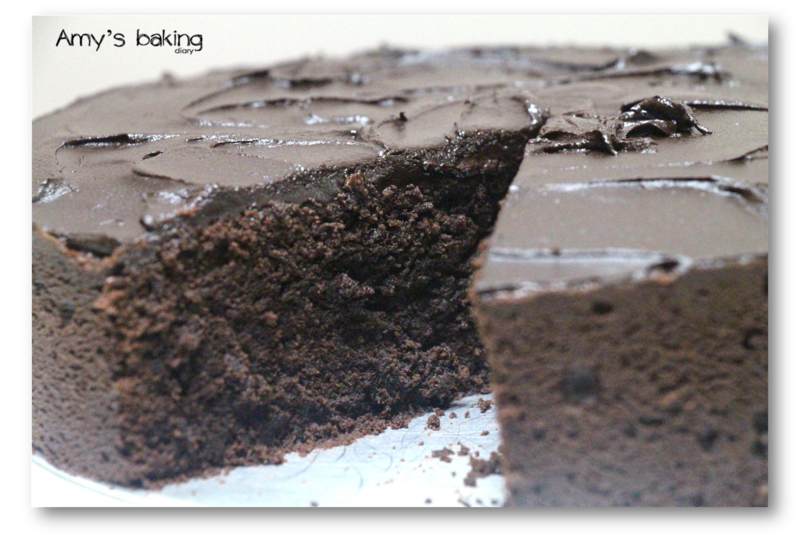 It’s chocolate lovers’ dream cake – dark and rich; moist and fudgy. The glaze is thick and luscious, and was beautifully spread over the cake and settle into a smooth glaze. You just need a small slice and it’s more than enough for you to satisfy your chocolate cravings. When my kids saw the cake, they Wow! Wow! Wow! non-stop. They really enjoyed the cake so much. 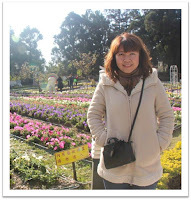 My elder son is meeting his aunt (姑姑) for lunch tomorrow and he requested for a slice for her. My younger son is attending his buddy’s birthday gathering and he, too asking whether he can have a slice for his buddy. Oh no! Before the cake is gone, I better quickly set aside some for my dear husband. He’s currently in Japan and will be home on Sunday. This is the type of cake that my family love - rich and moist. They’re not so fond of chiffon or feather like cake. For me I would prefer lighter cake to rich cake as it’ll make me feel less guilty and hopefully maintain my waistline. (1)Preheat oven to 160°C (325°F). Grease a 22cm cake tin. Place the butter and sugar in the bowl of an electric mixer and beat until light and creamy. Add the eggs and beat well. Sift the flour, baking powder and cocoa over the butter mixture, add the sour cream and chocolate, and mix until just combined. 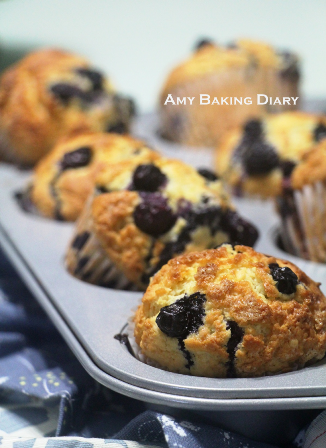 (2)Pour the mixture into the tin and bake for 55 minutes–1 hour or until just set. Cool in the tin. (3)To make the chocolate glaze, combine the chocolate and cream in a saucepan over low heat and stir until smooth. Allow the glaze to stand for 5 minutes before spreading over the top of the cake. Serves 8–10. 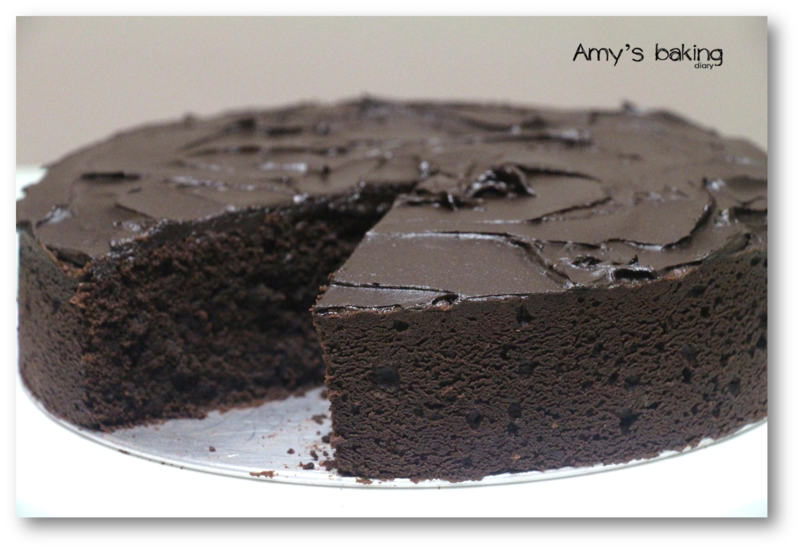 Amy , you need to make another batch of this cake :D I love chocolate cake recipe that calls for melted chocolate , most recipes out there only uses cocoa powder . Will have to try this recipe sometime . Thanks for sharing this ! Amy, this looks amazing! Thank you so much for sharing this recipe! Greetings from Montreal, Canada. Wow, wow, wow from here too! 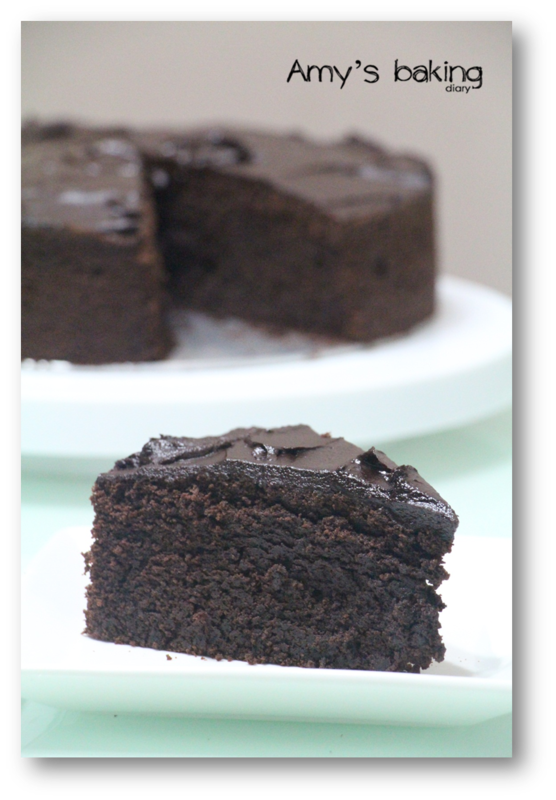 Am drooling just looking at your luscious chocolate cake. Bookmarked... Must try this as I have a tub of sour in the fridge. Your cake looks so divine! So moist, chocolaty and tender! No wonder your sons love it so much! DH's baking recipes are always first class!!! No doubt that your chocolate cake looks first class too!!! My husband and son love everything with chocolate!!! And happy to eat fluffy and light cakes too... phew!!! ...for me because I can bake both :p The only thing that they didn't like is cake or cookies that have desiccated coconut!??? Strange, isn't it??? I am IN LOVE with this cake!! I want it! 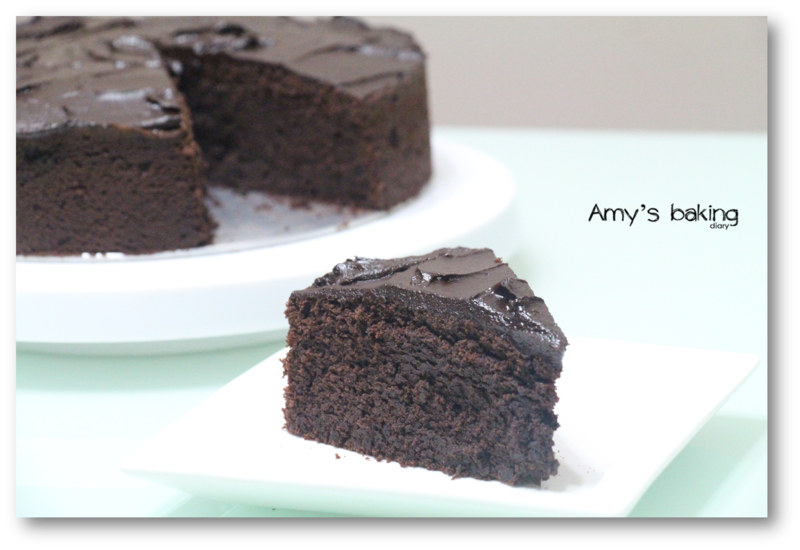 Hi Amy, chocolate cake is always my favourite cake!!! Beautiful cake and so sinful! I love baking this kind of cake but have to quickly share them if not I would be eating too much! This looks incredibly moist and chocolatey! Lovely!! PARECE QUE FICOU MUITO BOM ESSE BOLO, DEU ATÉ ÁGUA NA BOCA !!!! Obrigada por partilhar essa maravilha! yes love to have a slice of cake with a glass of milk. the cake looks terrific, amy! and i like the sound of moist and fudgy and i also like how dark the cake is! Amo chocolate, ficou apetitosa a imagens!!!! Generally I think young chaps love rich cakes. My niece was very happy whenever I baked buttery and sweet cakes. Once in awhile I like to indulge in a bit of it but also watching the health aspect. Getting old and didn't want my daily exercises going to waste. But I promise, I'll try some of your lovely cake recipes, hehehe!